Heat oven to 350°. Spray 1 1/2-quart casserole with cooking spray. Melt butter in 3-quart saucepan over medium heat. Cook carrots, onion and mushrooms in butter about 5 minutes, stirring occasionally, until mushrooms are tender. Stir in flour and salt. Gradually add milk, stirring constantly. Cook and stir until mixture is bubbly; remove from heat. 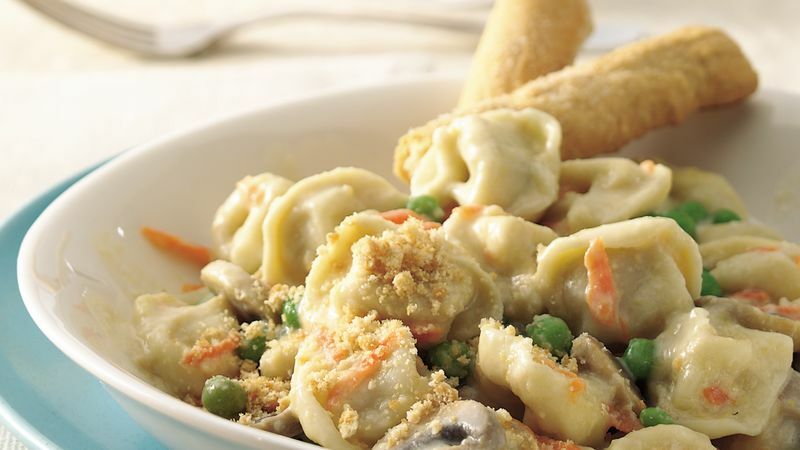 Stir in cheese, peas and tortellini. Spoon into casserole. Sprinkle with crackers. Bake uncovered about 15 minutes or until edge begins to bubble. Quickly dress up this casserole and give it a subtle smoky flavor by using smoked Gouda cheese instead of regular Gouda. This casserole is perfect for those who are looking for a meal without meat. Serve with a crisp Caesar salad and warm breadsticks.